The older you get, the more you covet comfort and relaxation, especially while in bed. However, if you are currently sleeping on a saggy mattress that leaves you waking up in agony, it is time for an upgrade. The Zinus Memory Foam 12-Inch Green Tea Mattress could serve your soothing needs by allowing for adequate sleep. The Zinus Memory Foam 12-Inch Green Tea Mattress is able to fit bed sizes ranging from full to California king. The memory foam is designed to adjust to the natural shape of a sleeper’s body. Overall, this mattress is meant to provide long-lasting durability and stability. This comprehensive review will determine if the Zinus Memory Foam 12-Inch Green Tea Mattress is your cup of tea. Green Tea Mattress Foam- naturally conforms to user’s body to provide maximum comfort and non-pressure support to ensure a good night sleep. Great edge support- If you ever sit on the edge of the bed, this mattress is strong enough to support your bodyweight. The 10 year warranty- Most mattresses break down and start sagging prior to 10 years. In case this mattress does within 10 years of purchasing it, the user can get a new one for free. Waiting 24 to 48 hours before use- If you are desiring a mattress to be ready immediately after you receive it, this one isn’t for you. It will take about 1 or 2 for the mattress to return to its original form. May be a bit too soft- If you are a person who prefers a firm mattress, the Green Tea Mattress may be too soft for your sleeping pleasures. Sleep a lot in their bed- This bed is durable enough to continuously withstand the weight of a person who take frequent naps (in addition to nighttime rest). 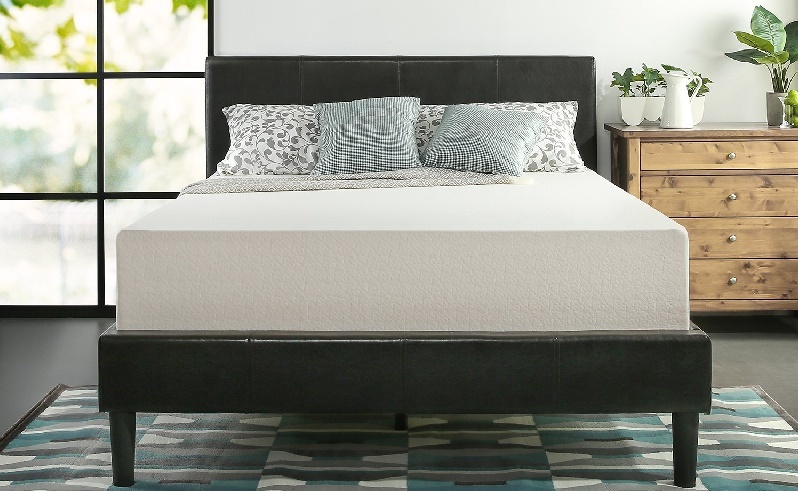 The Zinus Memory Foam 12-Inch Green Tea Mattress is the memory foam mattresses most people dream of. It is comfortable, durable, and provides antibacterial and anti-fungal protection thanks to infused green tea extract. In addition, the mattress is reasonably priced compared to similar mattresses. If firmness is a must, this is not the mattress for you. For everyone else, the Zinus Memory Foam 12-Inch Green Tea Mattress is a wise investment.